(TibetanReview.net, Jun17, 2015) – A panel discussion was held on Tibet on Jun 15 alongside the 28th session of the United Nations Human Rights Council in Geneva with the participation of Dr Sarah Sewall, the US State Department’s Under Secretary for Civilian Security, Democracy, and Human Rights. 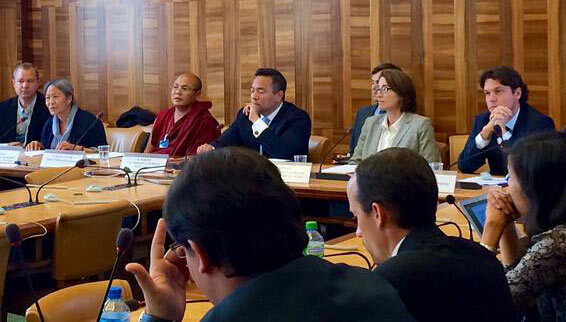 The co-panelists included the President of the International Campaign for Tibet (ICT) Mr Matteo Mecacci; Ven. Golog Jigmy, a former Tibetan political prisoner who had recently arrived in Europe; and Mr Juan Pablo Cardenal, journalist and writer as well as former China correspondent for Spanish newspapers. The theme was ‘Lockdown in Tibet’ with the event being organized by the Helsinki Foundation. She noted that many countries had urged China at the UN Human Rights Council to make more progress in upholding its international obligations to protect Tibetans’ fundamental human rights. In particular, she pointed out that in 2013, nine states had made Tibet-specific recommendations to China in its Universal Periodic Review process, calling on China to improve religious freedom, minority rights, and access for UN officials to Tibet. However, the Chinese government accepted only one of the twelve recommendations while otherwise responding with tightening of already strict controls on Tibetans’ freedom of religion, expression, assembly, association, and movement. Even the acceptance of that one recommendation – namely to allow the UN High Commissioner for Human Rights to visit Tibet – has still not been carried out despite requests by the current High Commissioner Zeid, she noted. She called these and China’s actions to denigrate the Dalai Lama unfortunate and counterproductive. Apart from problems about human rights in general, access to Tibet, religious freedom, she also said the tragic situation in Tibet, where some 140 Tibetans had set themselves on fire in protest, underscored the need for the Chinese government to resume direct dialogue, without preconditions, with the Dalai Lama or his representatives. She pointed out that the Dalai Lama only wanted to help preserve Tibet’s cultural heritage through genuine autonomy within the People’s Republic of China. ICT President Mecacci posed a number of questions to China to make the point that if the human rights situation in Tibet was really as great as being claimed by China, why it continued to be closed to UN rights officers, independent international journalists and human rights groups, and diplomats, while being tightly restricted for western tourists. He also asked, in particular, why, if human rights were respected in Tibet, China did not allow former UN High Commissioner for Human Rights to visit Tibetan areas of the PRC to assess the situation. Also sitting on the panel were US Ambassador to United Nations Human Rights Council Keith Harper, and ICT Europe’s Tsering Jampa and Vincent Metten.